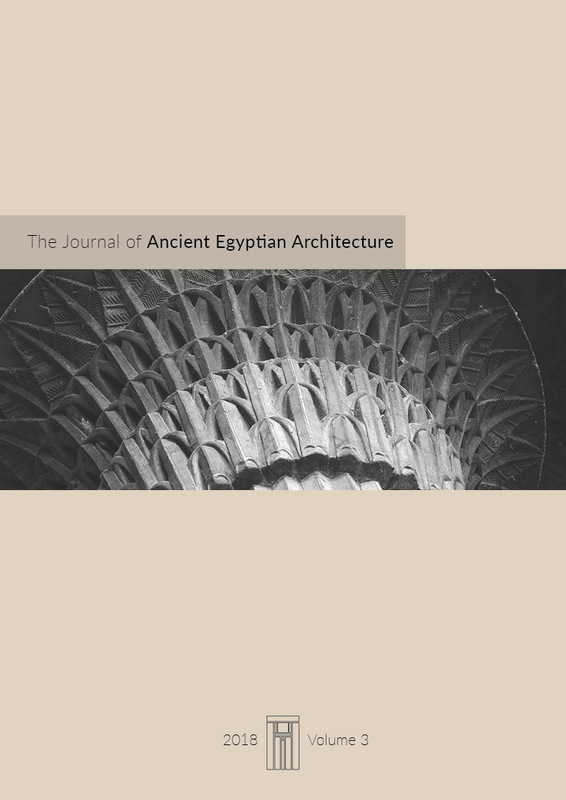 Click on the abstracts below to read the online version or to download the PDF of the Journal of Ancient Egyptian Architecture articles. Please be aware that online versions may contain specific content unavailable on PDFs. By focusing on archaeological data collected by Ernest Mackay in the early 20th century, this article proposes a revised reconstruction for the satellite pyramid of Meidum. This correction is followed by a discussion of who was responsible for constructing the main Meidum pyramid, and provides an opportunity to place all of the subsidiary pyramids within the giant tomb building program of Snefru, for the first time. The result is a comprehensive reassessment of the sequence of construction phases for the funerary sites of this king. Nearly 4,000 years ago, several governors of Elephantine constructed monumental tombs today numbered as QH31, 32 and 33, on the southeast slope of the necropolis of Qubbet el-Hawa near Aswan. The exteriors of these funerary complexes form a continuous façade overlooking the Nile, and each tomb incorporates an open courtyard. This present paper provides a detailed description of the exterior of each tomb and analyzes the building methods used to create them. The methods used to cut the façades are studied, as well as the techniques used to remove the bulk of the bedrock to create the complexes. This article presents results obtained from a PhD thesis defended in 2016 which studied land-based load transportation in the Egyptian Old through New Kingdoms. The main sources of information are iconographic representations of sled transportation, predominantly depicted in the rock-cut tombs and mastabas of the Old through Middle Kingdoms. The study addresses the current body of knowledge regarding the people and the technologies used during load haulage operations. By applying the results of the analysis, the author then estimates the weights of the loads moved and the sizes of the teams required to complete the hauls. The final objective is to fill lacunae in the current corpus of knowledge so that the various testimonies that have come down from Antiquity can be better understood. Many structural studies have investigated the behaviour of masonry arches and vaults, but less is known about the structural performance of Egyptian gable vaults, also referred to as rafter vaults. These were widely used in Egyptian funerary architecture during the Old and Middle Kingdoms. This paper presents a structural analysis of the mechanical behaviour of rafters used in these vaults, using the distinct element method. To study the relationship between the angle of the rafters and the stress distribution produced by the superstructure’s load, numerical experiments were performed using the UDEC software, and the results were then exported to Mathematica(R) for analysis. The vertical interface joints between the rafters at the top of the vaults, and the support points on the abutment walls at the sides, were studied in detail. The value of Young's modulus, a measure of the stiffness of the stone in the surrounding masonry, was also investigated. The analysis showed areas prone to failure and explained the existence of joint gaps between rafters. The relationship between angles of slope and failure was studied, and a minimum acceptable angle for two-layer rafter vaults was identified. The presence of a door jamb at the southern end of the preserved wall of Senwosret I has never been studied, despite the fact that it is a fairly prominent architectural detail. The position of the associated door made it necessary to extend the supporting wall to the south, well beyond the south-side of the large foundation dismantled by the excavator. Based on the details of this door, built during Senwosret I's reign, and the elevation of the Ptolemaic vestibule, as well as photographs of the excavation of the foundations, it is argued here that the chronology of the building sequence proposed by the excavator must be updated. Guided by the lines carved on the blocks of the foundation, the excavator envisaged a typical Ptolemaic temple plan, but attributed it to the Middle Kingdom. In reality, the foundation is Ptolemaic, just like the superstructure of the monument, now disappeared, that it once supported. Study of the archaeological evidence suggests that earlier interpretations of the development of the royal tombs of the 25th Egyptian Dynasty at the site of El-Kurru in the Sudan should be revised. Contrary to Reisner’s original theory, that their development followed a similar sequence to the pyramids in Egypt, which included an intermediate mastaba stage, the monuments in the Sudan underwent a more abrupt change to the pyramidal form, signaling the advent of their new empire. This article publishes a study of monumental false-door from an Old Kingdom mastaba, carried out in 2015. The objectives were to certify the authenticity of the false-door, to establish its probable date of manufacture, and to establish its possible archaeological provenance. Although in a poor state of preservation, the false-door is of special interest due to the atypical scenes represented on its left inner jamb, where priests are shown performing a series of rites. Photographic documentation of the false-door was subjected to digital laboratory processing to optimize images so that the iconographic and textual details could be appreciated and evaluated more easily. The study concludes with the identification of the owner of the false-door, by tracing its original installation location to a mastaba on the Giza Plateau, and by dating it to the late fifth dynasty.